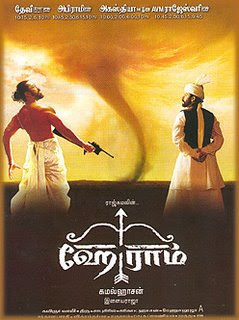 This was a movie which came out with sky-high expectations,only to fall flat at the box-office.I was just 13 when the movie released and the first time that I saw this movie,I lost all the respect that I had for Kamal for I cant understand any single part of the movie.Not just me,many faced this problem.Reason:THIS MOVIE, WAS AHEAD OF ITS TIME.5 years later,when I watched this movie again on television,I realised how naive I had been then, for this movie had everything in it to become a classic. The movie begins with 89 year old Saket Ram(Kamal Haasan) in his death bed.On his way to the hospital,he thinks about his past and the movie moves in to the "Flash back" mode to the 1940's.Saket and his friend Amjad(Shahrukh Khan) are close pals working in Mohenjadaro as archeologists.When Saket comes back home to visit his wife Aparna(Rani Mukherjee) in Calcutta,he find the city in shambles due to clashes between the local hindus and muslims.Amidst the clashes,Aparna is brutally raped and murdered by muslim extremists.Saket,in a fit of rage kills them all and because of this incident,he develops a hatred towards all muslims.What he does thereafter and how does he changes his mind forms the rest of the story. This is the first official directorial venture of Kamal and he does full justice to his tag.Just watch the video I've given below to know about his capabilities as a director.The story,screenplay and the narration are completely new to Indian Cinema.The most high point of the movie is the way Saket,whose initial aim was to kill Gandhi,later turns in to a Gandhian.Vasundhara Das,Hema Malini,Girish Karnad and Atul Kulkarni appears in meaty roles. Ilayaraja's musical score is one of the reasons the viewers,get engrossed in the happenings.It is of a very high quality and Iam convinced of the fact that it is one of his best works.Iam not going to say anything about Kamal's acting because I am too little a person to talk about his acting.In short he is amazing in the movie.This movie is a must for all those who wants to peep in to the times of Partition and the effect it had on common man. likewise i agree with u ,this film is surely a masterpiece from Kamal..
Nice post on Hey Ram.